Tigers & Strawberries » What a Crock! So, I bought this crockpot to use during the Chili Cookoff as a warming device. I never really figured I’d cook in it much; I never much liked the way a lot of crockpot recipes turned out back in the day when they had little cutesy mushrooms screen printed on the sides in the ever so vogue shades of harvest gold and avocado. On the other hand, I am moving and don’t have time to spend doing all the prep and cleanup from stir frying. And the idea of something that cooked itself while I slept, or packed or hauled stuff hither and yon had a certain appeal, as you can imagine. So, I figured, what the hell, and put the behemoth thing on the counter and rummaged in the freezer for that big chunk of free range organic chuck I had stashed away. I had originally planned to use it for Sichuan beef with turnips, but I decided I would make a pot roast out of it instead, because that would be a bit more versatile when it came to reusing leftovers in other dishes. So, out it came to thaw. While it was thawing, I dug around in the refrigerator to see what was in there. One parsnip that I didn’t use for the pea soup, and one and a half gigantic leeks, also left from that culinary endeavor, as well as a nice sprig of fresh rosemary. From dry storage came the handful of garlic cloves, and from the now nearly vacant spice cabinet came dried thyme, black pepper, chile flakes, kosher salt and you guessed it–Sichuan peppercorns. Oh, and a bay leaf. From the now-decimated pantry came a bottle of Shao Hsing wine, and a handful of Chinese dried black mushrooms. Of course I couldn’t make just a plain old pot roast; I had looked online for recipes using a crockpot, and had been nearly terrified into shoving the thing into a box and ordering out for pizza. If pizza delivered out here, I might have done it. But, as it didn’t, and I had a hunk of meat thawing, I persevered, though I had visions of the watery, lackluster meals from the mushroom-printed crockpots of yore in my head as I read along. I told myself that the principle of the crockpot was “low and slow” cooking which all of my training both as a cook and a chef told me was good. Most of the “recipes” I read were based on processed foods and boasted a minimum of ingredients. You know, stuff like Lipton Onion Soup Mix or a bottle of Kraft Italian dressing. None of them browned the meat first. Wine, other than that frightful salted crap from the grocery store, did not appear. So, I decided to hell with it all, I would fake it, as I most often do. I pulled out my trusty Le Creuset buffet pan, heated it up with some olive oil, and after dusting the beef with flour, I let it sear on all sides. Contrary to popular belief, this step does not “seal in the juices,” but rather, makes a nice brown crust, which produces a huge complex of flavors through a process called “maillard browning,” which is distinct from caramelization, which is the simple browning of sugar. 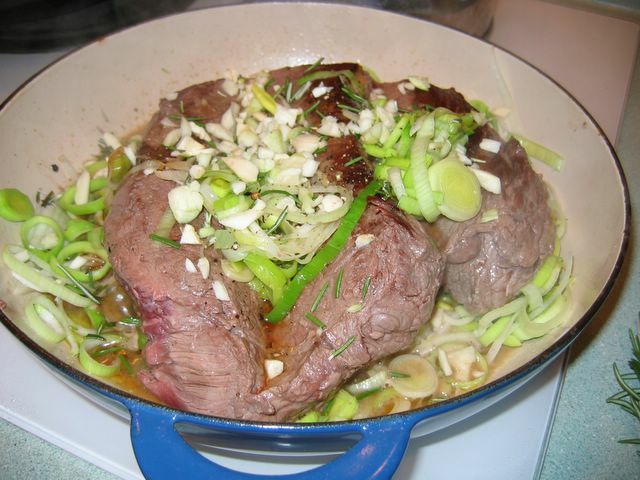 Browning the meat and leeks–a crucial step in creating a good braised meat in the crockpot. The maillard browning reaction is what happens when a group of amino acids, proteins or peptides react with glycosidic hydroxyl sugars (both present in the food) under heat, resulting in a brown pigmentation and a great many changes in flavor. It is non-enzymatic, meaning it is not like when you cut an apple and leave it out; nothing is reacting to oxygen here–it all happens under heat. Nearly all foods show this reaction during cooking, and wise cooks employ it to build up savory, “meaty” or just plain good complexes of flavors. In addition to making nice proteinish flavors, browning food makes it brown. Which is good, because brown is an appealing color for food; we tend to associate that color with the nice flavors that come about from browning. This rather obvious remark is to remind us that without browning meat, it has a tendency to look rather, well, grey. And while brown is a happy, appealing color for food, grey is not so much tasty-looking as kinda peaked and sickly. Not a good color for food. And the thing is, if you just stick meat into a basically clear liquid, like, oh, say, Italian dressing, it is not going to come out brown. It will be as grey as an unfriendly alien in your typical abduction scenario. In other words, it will be bloody unappealing. 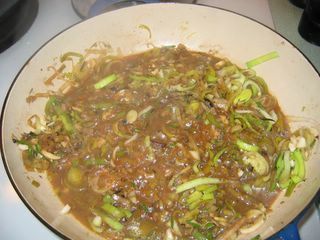 I browned the meat, added the sliced and washed and dried leeks,and let them brown. Then I took out the meat, and set it on a plate, added Shao Hsing wine and deglazed the pan, which is a fancy way of saying that I scraped up all the browned goodness that was stuck to the bottom of the pan and dissolved it into boiling liquid. Then I threw in about four cloves of minced up garlic, and let it simmer for about five minutes, until the leeks were a nice shade of brown. Waste not, want not: in deglazing the pan, you scrape up and dissolve all the little brown bits that are stuck on the bottom of the pan, which are filled with rich flavor and color. And then, I put the meat into the crock and dumped the entire contents of the pan on top, then set it in the heating element, and added a quart of beef stock, a bay leaf, the finely ground Sichuan peppercorns and some fresh rosemary. I had already packed my peeler, so I scrubbed the parsnip and cut it into chunks and added it to the pot, put the temperature gauge on super-granny-low heat (the one that takes ten hours to cook), covered the pot and went off to bed. The meat, leeks, mushrooms and parsnips in the pot before the beef broth is added. I discovered something about crockpots. When you cook while you sleep, the nice smells that the crockpots let out waft up the stairs and come get you. Like, the smell of the cooking beef woke me up. And made me hungry. This was not a good thing. The next morning, I looked in on the beef, and found that the meat and the liquid had turned a dark reddish brown, and smelled maddeningly delectable. But the meat was still a little tough, so I set it to cook for about eight more hours. Which it did. And the meat was done, and wonderful, but I needed to thicken the gravy. So, I turned it onto high heat and added flour dissolved in water; I didn’t feel that it was right to use roux and add more fat to the dish. I let it simmer for a while without the meat, then added it back in, and let it reduce for about another hour. And then we ate it, with some garlic mashed potatoes, some of Zak’s bread and some salad. Only, I was dim, and didn’t take a picture of the finished product before falling upon it in an famished feeding frenzy. So, sue me: I am a bad food pornographer. And so the moral of the story is this: so long as you ignore the idiot ideas like putting bottles of Italian dressing or soup mix into the pot and ignoring the necessary step of browning the meat, and just treat the crockpot as if it is a very low burner or a slow oven, you will make absolutely fabulous food. If you go for the three ingredient shortcut lackadaisical crap recipes, you will turn out the same watery dreck that haunts my childhood memories of the evil crockpots with the dancing mushroom screenprints. Yummy. That’s so not the pot roast I make or ever would’ve thought to make. 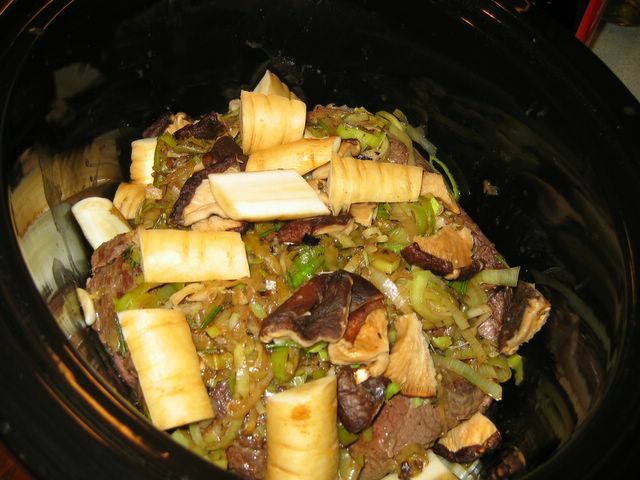 I trim and brown my chunk-o-meat, then place it on top of celery ribs in the crock pot. Sometimes I cut slits into the roast and insert slices of garlic too. About this point, I also sometimes need to throw a cat off the counter. I surround the roast with chunks of potato and onion and lots of baby carrots, maybe some additional chunks of celery, with everything seasoned well with freshly-ground black pepper (and skip salt if I use non-low-sodium canned tomatoes later). I also throw in a few crushed cloves of garlic and a bit of beef broth. Then I take a can of crushed tomatoes (seasoned or not, whatever I have on hand) and dump it on top of the roast to make a little crust. Cook on low all day, then enjoy one-bowl meal. Very American, very classic crock pot roast. No Lipton soup packets or Italian dressing. I could even be less lazy and use homemade beef stock, chop up my own fresh tomatoes, and add fresh herbs. I use my crockpot for making soup from poultry carcasses, so the browning is already there. I just made pot roast last weekend in the cast-iron chicken fryer I inherited from my ex-mil’s great-aunt (with garlic mashed potatos as well!) and, in response to reading your blog, put waaaaay more spices than I usually do in the broth (I brown it in the pan first and then turn the heat down) and made better pot roast than ever before. Thanks and honor to you. I am glad this sounded good. I always worry that my fusions are just too weird, but they always turn out tasting well. Okay, almost always. The Thai/Mexican tacos I made many years ago were wrong, but I have since refined my fusionability. My theory was this: I use Sichuan peppercorns and Shao Hsing wine in Chinese braised dishes all the time. Why not pot roast? No reason, except most people don’t do it that way. Well, that never scared me off before, so heh, why should it scare me now? The leeks–well, I will throws those in with nearly anything that sits still long enough, and they break down in braises and help thicken the cooking liquid all on their very own, so they are a natural. And, from my making of pho and following Nicole Routhier’s recipe, which included parsnips, to add sweetness to the stock, I knew that beef and parsnips were natural partners. The browning bit–that is ingrained culinary practice, but a lot of the feeling of the dish came out as French/Chinese. Well, howdy Wise Judith! We posted at the same time and thus I missed you. I am honored to have inspired your experimentation in spices. It is one of my missions in life to get people to stop being afraid of flavoring agents and learn to work with them comfortably. It isn’t hard and it is terribly fun. The secret ingredient in beef stew is soy sauce. Yeah, what you said, Ladi. I forgot to mention that I added a slop of dark soy sauce to the cooking liquid, instead of using as much salt. Soy sauce (which I should write a post about) has a lot of the compounds that make up that mysterious “fifth flavor” called “umami,” which is sort of a savory, meatiness. Black mushrooms have a lot of the same compounds in them. The two ingredients together, cooked along with a pot roast gives a hard one-two punch to the sauce, which thickens up to be the best gravy ever made. Hi Barbara: I know this post is old but I just had to tell you … I just bought one of those Le Creuset buffet pans (I didn’t know it was called that) and I LOVE IT. It was a gift to myself because my kitchen is being renovated and I am being very patient (it has been about 6 weeks so far and no end in sight). Grace–be patient with the kitchen renovation. It is hard, but the results are well worth the trouble and the wait. Believe me. I started out with the ugliest, worst designed kitchen imaginable, with crap appliances, and ended up with a gorgeous, well-appointed, sensibly designed workspace that satisfies my aesthetic sense while being a perfect tool for creating delicious food and happy people. As for the buffet pan–I love those. I think I need to get another one–it is one of the workhorses of my kitchen. I also have their braising pan and between the two, these are the pans I go to when I make pasta sauces, curries, pan-fried meats and pan sauces. They can even go into the oven as casseroles. I love them. You cannot go wrong with your new purchase. I hope you have lots of joyful cooking in your future soon with your new kitchen and new pan. O.K. So I know it’s about 3 years later for this post, but I was just browsing around the archives and came across it (do you feel all warm inside when someone tells you they regularly browse your archives? *lol*). I love crock pots! Hubby and I have a Rival 6qt. oval pot that we use all the time, from pot roast, to braised short ribs, to chili, to ham & bean soup. I don’t use crock pot recipes, and I don’t even own any of those nasty crock pot recipe books. Instead, I use my know-how from culinary school to create braises, stews, and soups that are perfect for the crock pot. I consider the crock pot a necessary piece of equipment in my kitchen.